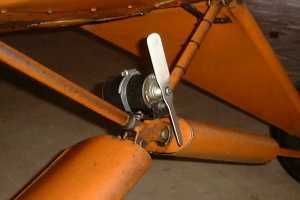 Most European aircraft are required to carry transponders, requiring Cub drivers in Europe to figure out how to power the thing. A commercial generator is north of $500, but here's a home fix by Mattias Johnsson of Sweden. 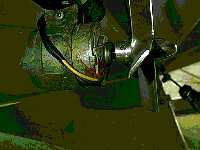 Its a conversion from a 12 volt electric starter intended for a radio-controlled (R/C) airplane. "Open circuit," Mattias writes, "I get 15.6-16.3 volts at 75 - 110 mph [indicated airspeed], and the short circuit current is 3.6-4.9 at the same speeds. As I have a quite robust battery (high current, long-life 28 amp/hour sealed lead-acid) I didn't bother to build a regulator. I just put two diodes (MR754) in series and hooked it on the battery. I judge the risk for over-charging as quite small. "Measuring directly on the battery," he continues, "the voltage stabilizes around 14.3 volts with the current going down to 30-40 milliamps at that voltage. The maximum charging current I've measured (after draining the battery quite a lot first) is 2.5 amps. Perfect, in other words! "I've been flying with it for about 30 hrs now and I'm very satisfied. The biggest problem was to find a robust starter to convert. The ones sold nowadays are very cheaply built with a lot of plastic parts and simple bearings. I found a used "Pylon Brand Hi-Tork" with a robust metal housing and real ball bearings at both ends. It's a bit heavier (1.15 kg, 2 lbs something...) but that isn't really a problem for a Cub." The prop is home-formed from a piece of aluminium, 1 x 8 x 3/32 inches in size. Mattias intends to replace it with a wooden prop, the better to suit the Cub tradition. "The mounting bracket is not the final one," Mattias adds. "A huge hose clamp isn't that beautiful! But I discovered that the clamps around the diagonal tubes are important. No matter how stable the bracket (seen from behind) is, it's very easy to come into oscillations (one rotating propeller blowing on another) which creates a very annoying sound. Not to mention that the bearings probably [would] be worn out too early." "To built my wind generator I used a rotary flashing light motor and cut the gear head off, then I cut the rotor shaft on a lathe. You can use any permanent magnet brush type 12v motor [such as] car wiper, electric window motor. These motors will produce DC voltage when you spin them. My generator produces over 50 volts at cruise speed without the regulator and no load. I built the prop with 1/2 ins aluminium shaft and welded 4 pieces of 1 in. wide by 1/8 thick flat bar at 45 degree angle. 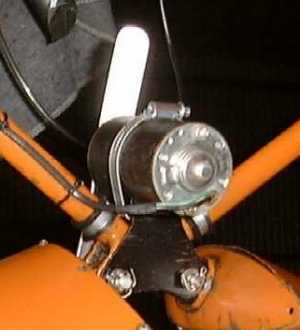 I use a voltage regulator from a snowmobile but you can find good used regultor on motorcycle also. My battery pack is in fact ten 1.2 volt nickel cadmium batteries connected together. After everything was done I tested the unit in flight with a voltmeter and ammeter to produce just enough power to supply my handheld radio, intercom, and GPS, and an extra 200 to 300 ma to keep the pack fully charged. This was done by cutting down the prop until you reach the desired power. I ended up with a 4-inch diameter prop that does not produce too much drag--in fact, I don`t see any speed lost. If you need more power you just go with a longer prop. The whole unit weighs only 4.5 pounds with batteries and cost me next to nothing and i don`t have to worry about battery condition anymore. You can find almost everything you need to built in scrap yards."